The Genie III lamp is very versatile: use it as a shelf lamp, wall lamp or hanging lamp (fits in most Aladdin wall brackets and hangers). 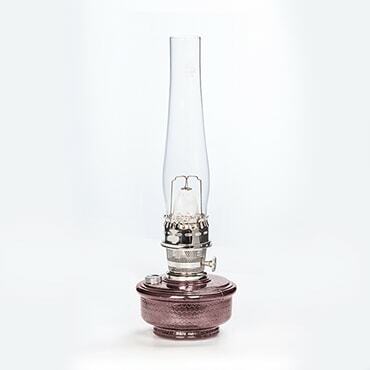 Be sure to add one or more of these popular Aladdin lamps to your collection and also be prepared for emergencies. Note: Add an Aladdin parchment shade at any time (Aladdin tripod is required). Glass shades are not recommended because of the design of the glass bowl. IMPORTANT: We recommend using only Aladdin lamp shades with your Aladdin lamp. Generally, Aladdin lamps produce more heat, which other shades may not be able to withstand. 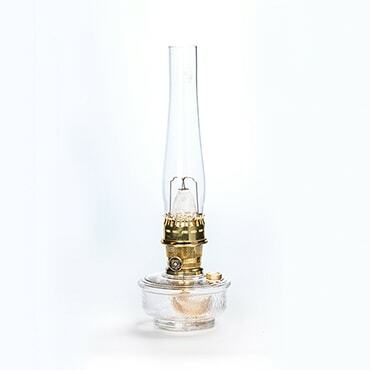 Our Clear (Brass Burner) is OUT OF STOCK, but we have ordered more! You are still able to purchase it now and we will ship it to you as soon as it arrives. Questions? Please call 1-800-438-5346 or email us at info@Lehmans.com. Our Clear (Nickel Burner) is OUT OF STOCK, but we have ordered more! You are still able to purchase it now and we will ship it to you as soon as it arrives. Questions? Please call 1-800-438-5346 or email us at info@Lehmans.com. I purchased this for my wife for valentines day, we have yet to use it but the quality looks exceptional. We also purchased the shade ring and shade as others have done. First, Lehman's shipped my order very fast and well packaged. The font it glass and looks nice. I was disappointed with the filler cap it is very poorly made and will not last long it is more like a soda cap. Also the cork liner kept falling out. Had to use double sided tape to hold it in. The gallery and burner are also of lesser quality than my old ones. I will not purchase any more new ones. 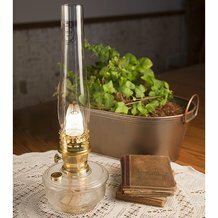 However the lamp works well and looks great and will probably give long service. I just prefer the older ones.